The Netherlands Center for Electron Nanoscopy (NeCEN) is the Dutch advanced cryo-electron microscopy facility situated in Leiden at the Institute Biology Leiden (IBL) at Leiden University (UL). It specializes in data collection for high-resolution structure determination of single particle analysis of proteins and viruses and in data acquisition for cryo-electron tomography of protein complexes and bacteria. The NeCEN is closely affiliated the the Electron Microscopy Section from the LUMC. 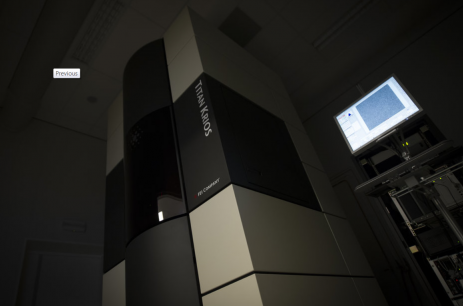 Also it is located in close vicinity to our laboratory and our in-house workflow is compatible with the Titan Krios microscopes.The access to NeCEN is arranged via NEMI. NeCEN offers access to two Thermo FischerTitan Krios cryo electron microscopes, one specifically equipped for cryo electron tomography, including an energy filter and K2 direct electron detector, and one for single particle analysis cryo electron microscopy, with Cs corrector and Falcon III direct electron detector. NeCEN also houses a cryo-FIB-SEM for thinning of cryo -specimens and a Thalos Arctica. Mor information can be found on the website of NeCEN.